Dr. Cam grew up visiting a chiropractor since he was 11 years old. He had a strong interest in fitness and health and knew he wanted to work in health care. In his last year of university he started experiencing frequent headaches. No matter what he tried, his chiropractor was the only person who could help him find relief. This is when Dr. Cam began to understand what chiropractic care was really about. By aligning your spine, your nervous system can help your body heal naturally, on its own. Dr. Cam realized he wanted to help people find relief from headaches just as he was helped. After attaining an honors degree in Kinesiology from the University of Western Ontario, Dr. Cam found that the chiropractic philosophy resonated with him. He decided he wanted to move forward with a career in chiropractic care. 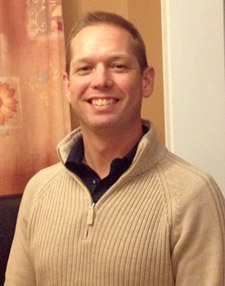 Dr. Cam graduated from The Southern California University of Health Sciences as a chiropractor in 2001. He enjoyed the in-depth education he received as he learned how incredibly the body can heal through chiropractic care. Dr. Cam’s mission is to help as many families achieve an optimal state of health without the use of drugs or surgery. We all have different backgrounds, health needs and goals. Dr. Cam is here to help show you what chiropractic is and how it can help you. We offer you natural solutions to your health concerns so you don’t have to rely on drugs or surgery. Then it’s up to you to decide how you’d like to move forward! As a man of faith, Dr. Cam puts his faith first, family second and then everything else after that. He enjoys spending time with his wife Sandy and stepson, Cameron. Together as a family they share a love for animals. Dr. Cam also provides chiropractic care to the dogs at the Humane Society and is active in his church ministry. Wondering how Dr. Cam can help you? He’d love the opportunity to help you and your family get better. Call today!